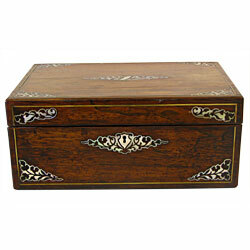 Victorian Brazilian Rosewood Travel Box with Mother of Pearl Inlay, mid 19th century. With an interesting family provenance relating to the artist John Glover, this box was sadly in poor condition due to much use and travelling. Both structurally and aesthetically the box required major restoration work. The utmost care was taken to preserve the original patina, which is so important to this box’s story. The travel box was dismantled and then re-glued with traditional hide glue. Missing veneers were carefully patched to match the original rosewood and missing sections of mother of pearl were cut and shaped to replace those lost. Small sections of brass stringing were also replaced, while the original interior and silk velvet writing surface were all retained.